Born in San Francisco Chinatown, unable to speak Chinese and a thoroughly American woman, playwright Lauren Yee has written an homage to her father and Chinese-American culture in King of the Yees, which opened at San Francisco Playhouse this past weekend. The play is funny, insightful and touching. And it’s brilliantly produced, with inspired direction by Joshua Kahan Brody and non-stop, fast-paced acting by a team of five actors in multiple roles. Centered in an otherwise dark stage is a bright red double doorway, with Chinese ideograms in gold inscribed on the casing, the lintel curving upwards at the ends like the roof of a temple. This is the doorway to the Yee Fong Toy Family Association. And, if you will, it’s a portal to another world, one in which the protagonist, the playwright, has trouble entering. Even though she is the daughter of her father, Larry Yee, the doors won’t open to her touch. Entering them becomes part of her hero’s quest, when her father suddenly and mysteriously disappears. Jomar Tagatac plays the erhu as Larry (Francis Jue) and Lauren (Krystle Piamonte) discuss their family. 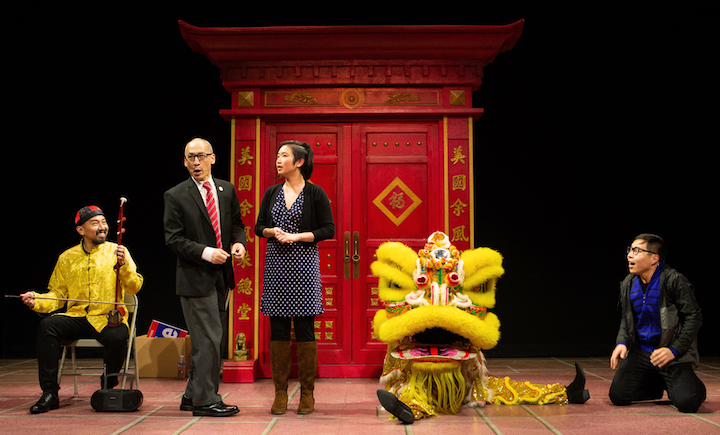 Lion dancer Rinabeth Apostol and Danny Ma (Will Dao) look on in King of the Yees at San Francisco Playhouse. Photos by Jennifer Palopoli. The play opens with two actors, Rinabeth Apostol and Jomar Tagatac, addressing each other and the audience about the play. Rinabeth plays the playwright Lauren, and Jomar her father Larry. Their explanation of the play is interrupted when the “real” Lauren (Krystle Piamonte) and Larry (Francis Jue) appear. Lauren wants to present a play for two players about her and her father. It’s an homage for his very important 60th birthday, but Larry is intent on changing the script. Soon the four actors are joined by another Chinese-American, seemingly plucked out of the audience, a Ma, or cousin family to the Yees. The original duo of actors disappears to reappear, transformed by Larry’s imaginings into a Lion Dancer and an ehru player in yellow silk tunic and cap, creaking away on a bowed two-string instrument. Larry Yee is full of family stories, including the mythology of the Model Ancestor, the revered Yee Chung Sheung, who saved the Yee family from destruction millennia before by moving south in China away from bloodthirsty attackers. Larry’s dedication to his family, including his distant cousin Leland Yee, who uses the good-hearted Larry as a dogsbody in his pursuit of political power, is a thorn in the side of his Yale-educated moving-to-Berlin-with-her-Jewish-husband daughter. While Lauren and Larry debate the merits of unconditional family loyalty, the two actors, now on break, discuss their own Chinese-ness. Rinabeth is actually Korean, and Jomar is three-quarters Chinese, with an Irish grandmother in the mix. As he says, one quarter of him oppresses the other three quarters. Like Lauren, they struggle with their ethnic identity, which seems at odds with their national identity. Then disaster hits. On the way to the Yee Fong Toy Family Association’s birthday dinner for Larry, news breaks that Leland Yee has been the perpetrator of a financial and political scandal. Larry disappears and Lauren sets out to find him. That means entering the portal of the Yee Fong Toy Family Association. The second half of the play is a surreal comedy full of imaginary and symbolic characters that we have met in their more mundane manifestations in the play’s first half, along with new ones, such as the elders hanging out in Portsmouth Square, the lady selling whiskey to tourists and mind-blowing Chinese whiskey to those who are “worthy”, and Shrimp Boy, the fur-clad gangster whose very name conjures up thunder and flickering lights. The Model Ancestor takes on a hot pink persona, complete with hot pink–clad ladies-in-waiting that resemble the be-wigged back-up girls in a Chinese R-’n’-B group. It’s all great fun, with the kick of a maotai cocktail. But underlying it are the realities of our lives with their generational misunderstandings and cross-cultural confusions, everything sewn together with undying love and loyalty. A thoroughly enjoyable evening. Hats off to everyone! The King of the Yees continues at the San Francisco Playhouse through March 2. For information and tickets, visit sfplayhouse.org.